Museum as Retail Space (MaRS) is pleased to present The Quiddity of Presence by Kristan Marvell, his first solo exhibition in Los Angeles. The exhibition shows monumental sculpture and amalgam light wall reliefs. We must un-educate ourselves and look back towards the shadow. The alchemy of image making is in the shadow. The primeval simulacrum of reality is the shadow. 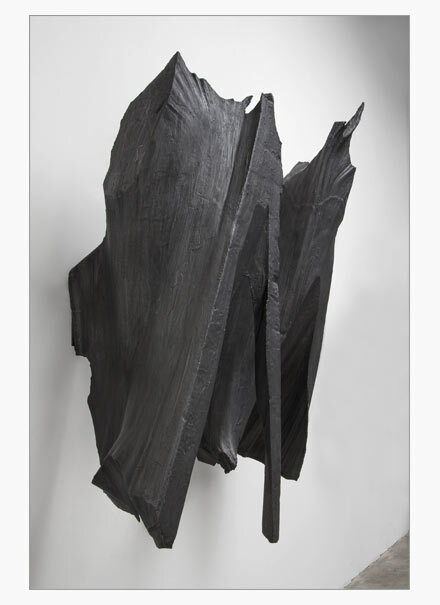 Marvell’s sculptures are resultant of a dancelike act finessing large bowed hot-wires, fluidly slicing monolithic blocks of styrofoam evoking stalagmites or eruptions of flame. Geological fragments to momentary flares, his forms capture our horizons of time. Shifting frequencies of light are projected across works casting inverse complementary shadows, multiplying their composition and presence. Other works are coated with combinations of resin, paint, or graphite to control their dynamic with light. The invisible and ephemeral quality of light is weighed against the presence of mass. Marvell further conflates shadow and form with a projection of fluctuating composite wavelengths over an energetic relief. The absence of mass leaves us only with an image of shadows, the prime simulacrums with transformative power to return us to reality. Kristan Marvell’s sculptures derive from a technique, which he developed and has worked with over the last twenty years, that he calls spontaneous carving. 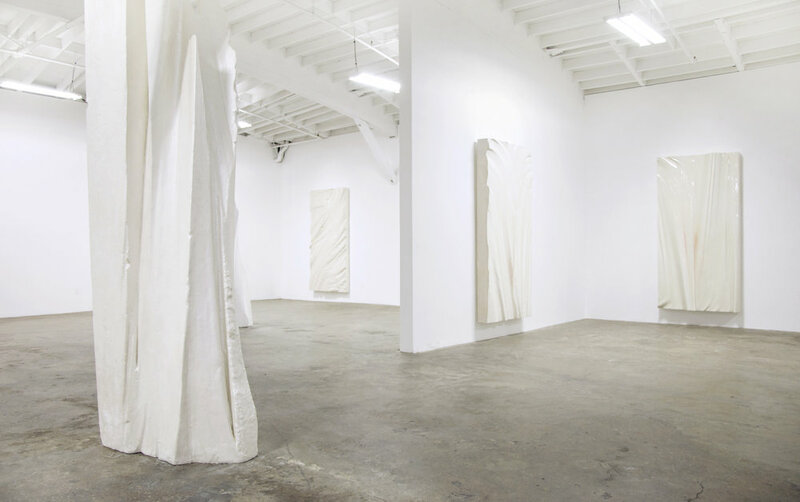 His bronze sculptures begin as monolithic chunks of Styrofoam. As a stone carver has marble, Marvell has Styrofoam. 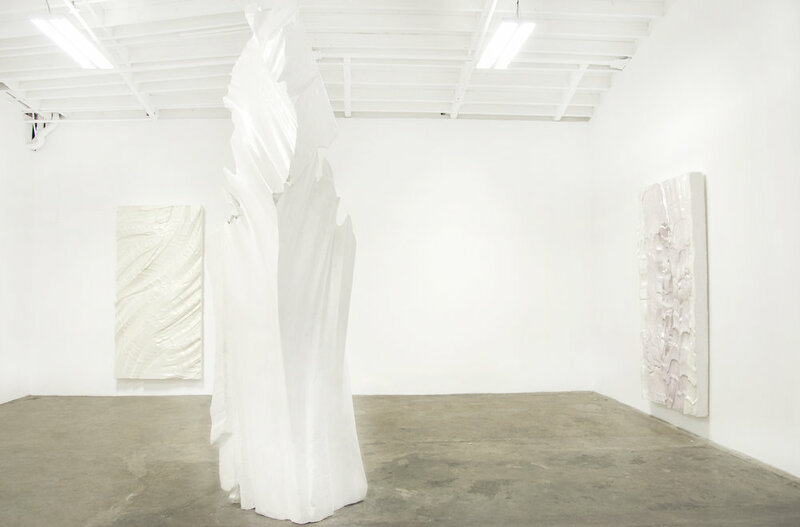 The sculptures evolve as Marvell pulls and manipulates large hot wires through massive blocks of Styrofoam. This process allows for the improvisational removal of material and produces a unique visual vocabulary. Also, Styrofoam, a material devoid of sensuality, an industrial emblem, is in a sense corrected and made sensual as it progresses towards its transformation into bronze. Through this visual vocabulary Marvell explores the confrontation between the natural, the organic, and man’s manipulation and reconstruction of the world. On the most obvious level, the natural landscape is used as a point of inspiration, a visual ode to the raw power of its geological beauty. The work acknowledges and utilizes nature’s ability to elicit emotional transcendence. 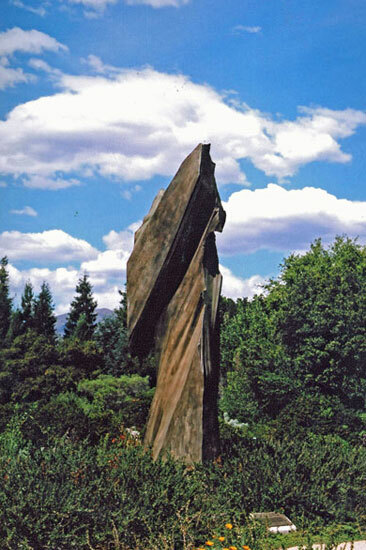 However, the sculptures are not replicas of natural formations. As a sculptor, Marvell, is interested in thematic or formalist concepts such as the relationship between mass and density, or volume and spatial balance. He likes the enigma of creating sculptures where mass is levitated in unusual ways, where unknowing fragility is able to bear great weight. By way of modernist formal concerns the work references the concept of man’s transformation of nature through the intellectual event of manipulation. As the eye wanders the sculptural planes, there is a sparseness, a focused control of surface and texture, in which the hand of the artist is evident. In that organization of space, a thoughtful and heart felt integrity emerges, imbuing the sculptures with emotion and grace, reaffirming the power of the object.